Thieves have stolen the late Amy Winehouse’s wedding dress from her former Camden home. The dress was one of two stolen after the house was opened up to the public following the singers death, and estimated to have a value of around £130,000. Both dresses were set to be auctioned to raise money for the Amy Winehouse Foundation. Along with the dress Winehouse wore at her 2006 wedding to Blake Fielder-Civil, the thieves grabbed the ‘newspaper print’ cocktail dress Winehouse wore on Later with Jools Holland in the same year. “We are all baffled as to why some of her designer dresses didn’t go too. There were a couple from Dolce & Gabbana worth a fortune. The high price the dresses command have led many to speculate they were stolen to order. We very much doubt they’ll be showing up on eBay anytime soon.. 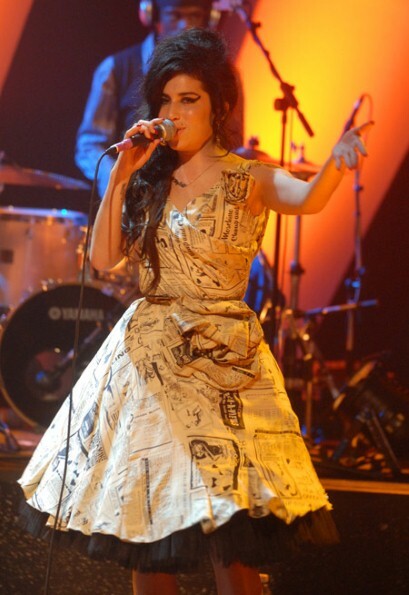 Here is footage of Winehouse performing on Jools Holland wearing one of the stolen dresses.